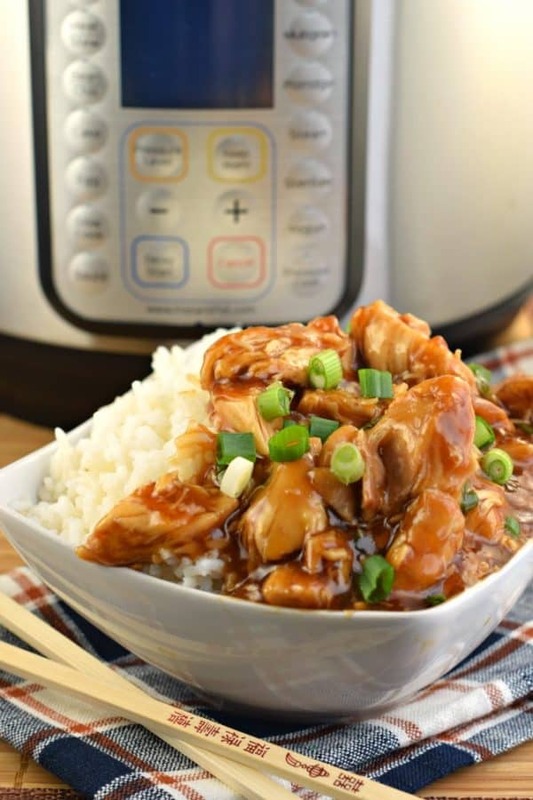 From start to finish, this easy Instant Pot Bourbon Chicken Recipe is ready in under 30 minutes! Packed with flavor, it’s faster than going to the mall to pick up a plate of this dish! If you stopped by and realized a little too late that you don’t own an Instant Pot. It’s Okay. Don’t leave. First, go order an instant pot. You may find it life changing. Many people love how quick you can get dinner on the table, from frozen chicken to bourbon chicken in MINUTES. Second, you don’t want to order a pressure cooker quite yet? I completely understand. 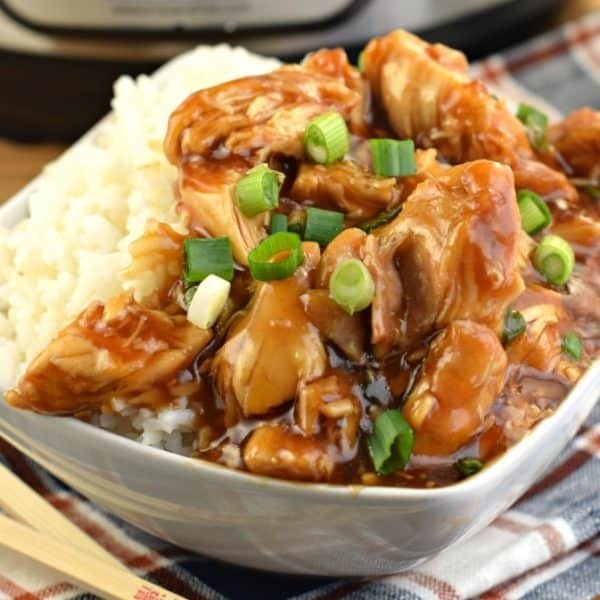 Go check out my Slow Cooker Bourbon Chicken recipe. Enjoy. The rest of you, welcome back to another Instant Pot recipe. In case you missed the previous ones, just check out my Instant Pot archives! Well it actually originated in New Orleans (named after Bourbon Street). However, you’ll find most food courts carry this delicious dish at asian restaurants. Admittedly, I thought it was a chinese dish until I looked into where it came from! I just thought it was named after the Bourbon used in the ingredient list! You may sometimes find this called honey bourbon chicken. First step is choosing your chicken. For today’s dinner, I usually opt for boneless, skinless chicken thighs. I find they stay tender and juicy after cooking, and really soak up the flavor. However, boneless, skinless chicken breasts work equally as well, with no changes needing to be made for the recipe. Also, you can use frozen chicken and put it right into the instant pot. If you’re making this recipe using frozen chicken breasts or thighs, add 6 minutes to the pressure cook time (taking it from 12 minutes to 18 minutes). This will result in perfectly cooked chicken! So, you have your chicken, set it aside. In the bottom of your instant pot, start adding your ingredients. Apple juice, Bourbon, soy sauce, brown sugar, ketchup, honey, crushed red pepper flakes, fresh garlic, and ginger. Use a whisk and mix it really good. Place your fresh or frozen chicken into the instant pot, making sure if’s coated in the bourbon mixture. Secure the lid to your pressure cooker, and turn the release valve on top to sealing. Turn on the Instant Pot and press manual (or pressure cook) on high. Set the timer for 12 minutes (or 18 minutes if using frozen chicken). Allow the pressure to build and cook. While it’s cooking, mix your cornstarch and cold water in a small bowl until combined. Set aside. Once the chicken is done cooking, allow it to naturally release for 5 minutes. Then do a quick release. Remove your chicken from the instant pot and place it on a cutting board. Dice into bite sized pieces. Turn your pressure cooker to saute and slowly add in the cornstarch mixture. Using your whisk, mix continuously until thickened. This takes about two minutes! Turn pressure cooker off and return chicken to the sauce. Top with green onions and enjoy! 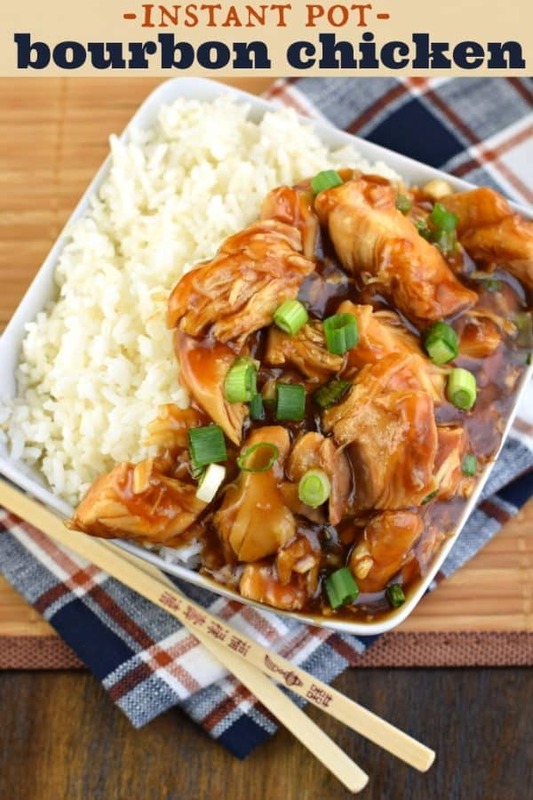 We love serving jasmine rice with this bourbon chicken recipe. I suggest you start the rice FIRST, and while the rice is cooking you can prepare the bourbon chicken. You can also choose instant rice if you want it quicker! My kids are big fans of mashed potatoes. They can eat them with anything. So these Baked Mashed Potatoes are always on our menu, as the girls like to put their chicken and glaze over their potatoes. 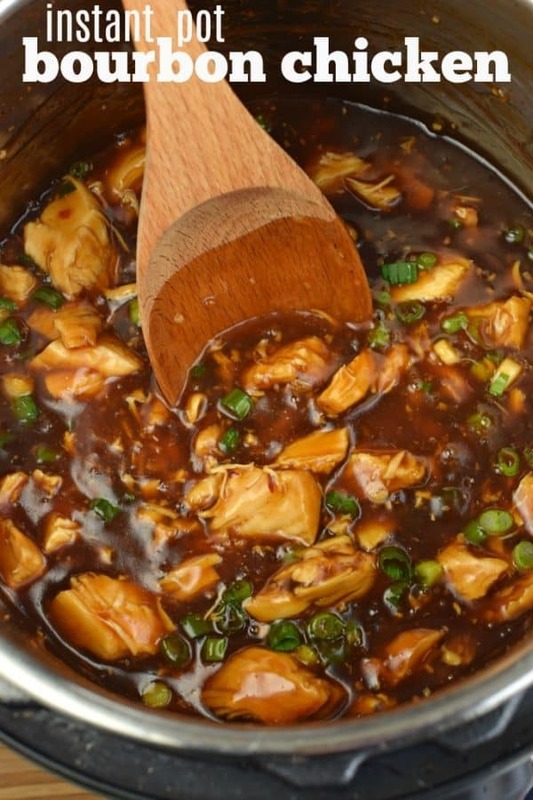 What can I substitute for the Bourbon in bourbon chicken? I know you’re going to ask, “I don’t drink alcohol, what can I use in place of the bourbon.” Well, first, you will lose some of the flavor by swapping it out. However, you can just replace it with more apple juice instead. It will still be delicious, but lacking that little bit of zip from the bourbon! Chicken broth or beef broth will also work as a substitute. I recently found ginger paste in the grocery store, which is a great alternative to ginger (in the spice jar). I used 1 tsp of the ginger paste instead of the 1/2 tsp called for in the recipe. You can also freshly grate ginger if you prefer. 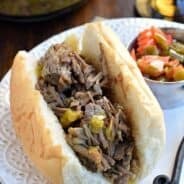 Tender roasted, French Dip Sandwiches cooked in the Instant Pot. Piled on a crusty french roll with extra cheese, this flavorful dinner is then dipped in au jus! Make juicy, sweet and tangy chicken in your crockpot with this easy Slow Cooker BBQ Chicken recipe! Comfort food. This Chicken Tetrazzini recipe has been a family favorite for many years! It’s also a great dish to bring a new mom! Easy, crunchy, delicious Baked Ranch Chicken Thighs By Sweet C’s Design are a super simple one pot baked chicken thigh recipe that is – bursting with ranch flavor in only five ingredients, and a keto chicken thigh recipe everyone loves! 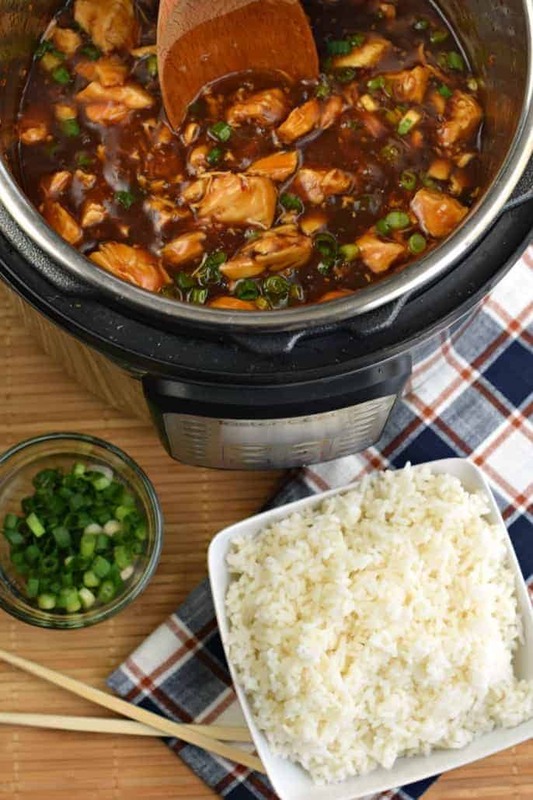 From start to finish, this easy Instant Pot Bourbon Chicken Recipe is ready in under 30 minutes! Packed with flavor, it's faster than going to the mall to pick up a plate of this dish! In the bottom of your instant pot, start adding your ingredients. Apple juice, Bourbon, soy sauce, brown sugar, ketchup, honey, crushed red pepper flakes, fresh garlic, and ginger. Use a whisk and mix it really good. Place your fresh or frozen chicken into the instant pot, making sure if's coated in the bourbon mixture. Allow the pressure to build and cook. While it's cooking, mix your cornstarch and cold water in a small bowl until combined. Set aside. Remove your chicken from the instant pot and place it on a cutting board. Dice into bite sized pieces. Turn your pressure cooker to saute and slowly add in the cornstarch mixture. Using your whisk, mix continuously until thickened. This takes about two minutes! Turn pressure cooker off and return chicken to the sauce. Top with green onions and enjoy! 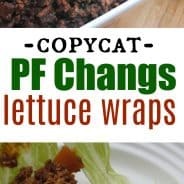 I’ve just recently purchased an Instant Pot, so I can’t wait to add this to my list of must try recipes! This bourbon chicken looks so good. And I love that you can now make it in the instant pot. This is absolutely fantastic. One of my favorite recipes ever. 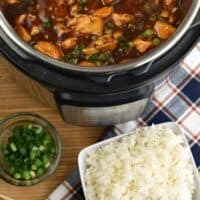 Love an easy instant pot chicken recipe. Can’t wait to try this! 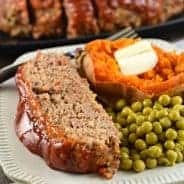 Instant pot dinners are the best and this is no exception! Love it! I’ve never tried honey bourbon on chicken before and it was incredible! Can this be done in a crock pot. 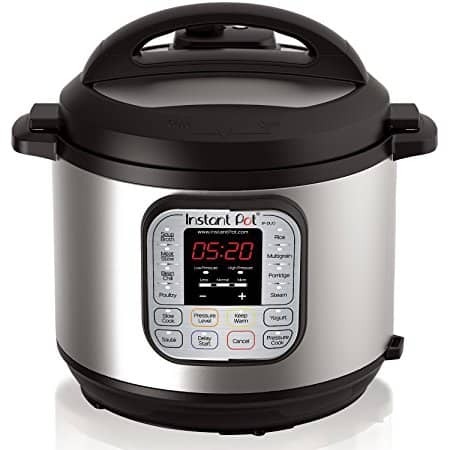 I do not own an instant pot because do not have room for it. Turned out just perfect. Now a favorite. This was seriously amazing! We have made it and I sent the recipe to my mom… she has alredy made it twice! Thanks for a great new go to recipe! !